These are really good biscuits. They are similar to the Red Lobster biscuits. Give them a try the next time you have soup. 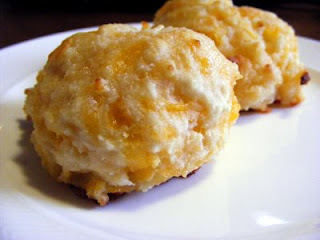 Mix Bisquick, milk, and cheddar until a soft ball forms. Drop by 1/8 cup balls and bake at 450' for 8-10 minutes. Now mix butter and garlic powder. As soon as the biscuits come out of the oven roll in butter mixture.